Carlson Design – Our Plotter/Cutter is Wider than Yours. Our Plotter/Cutter is Wider than Yours. Bydesign in Nairobi, Kenya gives a BIG “thumbs up”. They have the widest Carlson in the World at 14.5' wide (4.41m)! 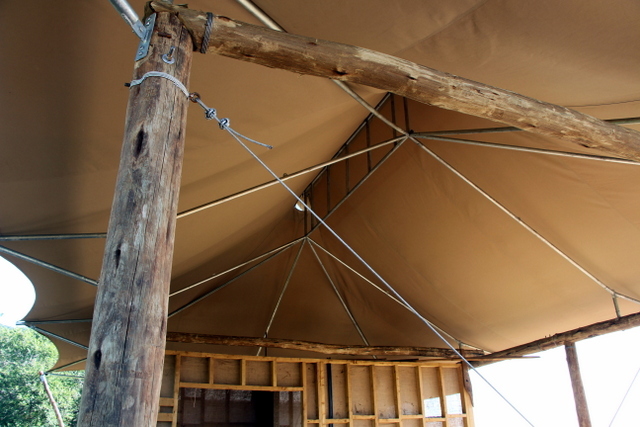 How do you make a big safari tent designed in Archi-cad or Rhino or any other CAD program that has multiple complex shapes cut out of pre-sewn 3m x 5m panels? 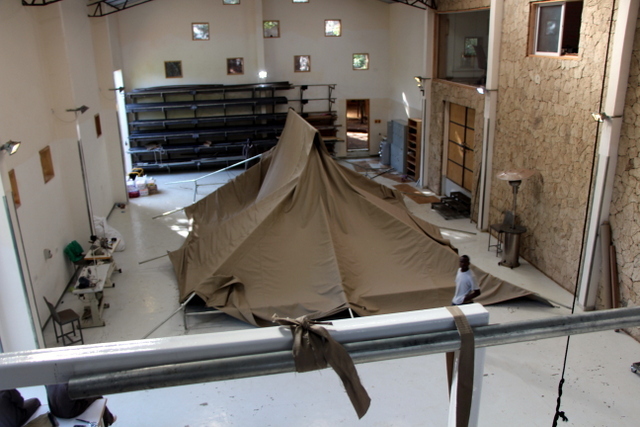 How do you make 28 of these seven-panel tents quickly, accurately, and on schedule with a dozen other contractors working in the Masai Mara?? How do you start another order in the middle of this job??? However, at Carlson Design, we asked for it! To solve ByDesign’s automation challenges, we built our widest system to date — a WT-174″ Plotter/Cutter and turnkey installation. 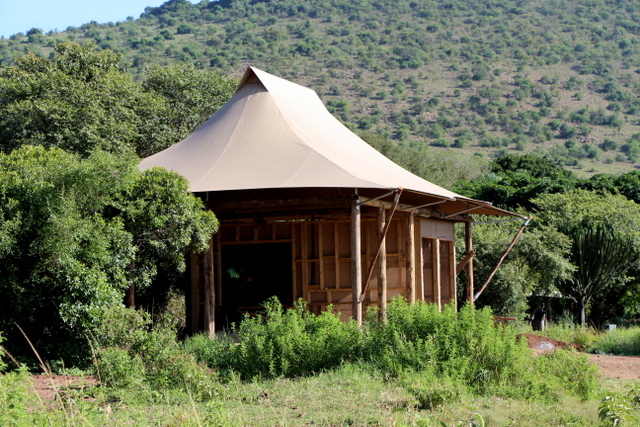 ByDesign is producing 28 of these beautiful luxury tents for the Kichwa Tembo camp in the Masai Mara outside of Nairobi, Kenya. Each structure consists of 7 computer designed panels made up of five smaller panels. It was finally time to automate, because this isn't going to meet the deadline! And this isn’t the way to draw that complex slope you just designed in Rhino. 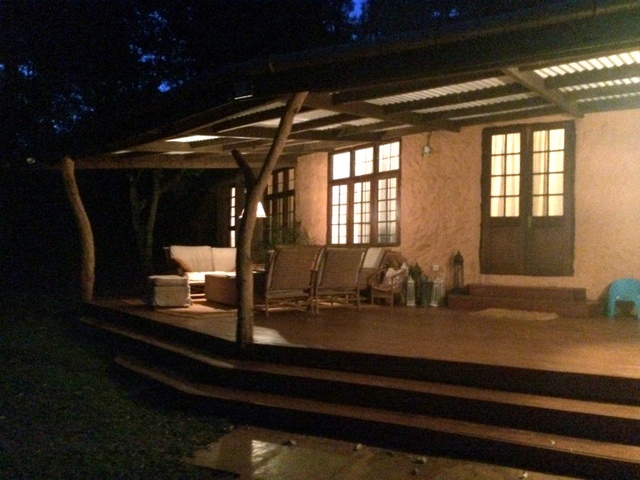 On the eve of their 10th year in operation, ByDesign of Nairobi, Kenya has a growing reputation for producing beautiful large, custom, high quality tent camps. And, as word continues to spread, they are once again looking to double last year’s sales figures. When Jan Allan, the owner and founder, originally built his new facility his friends and family teased him about its enormous size. “Har, Har — is that a monument to your ego?” one friend jabbed. But sure enough, his vision took root and now he would love to have a building 3X larger. 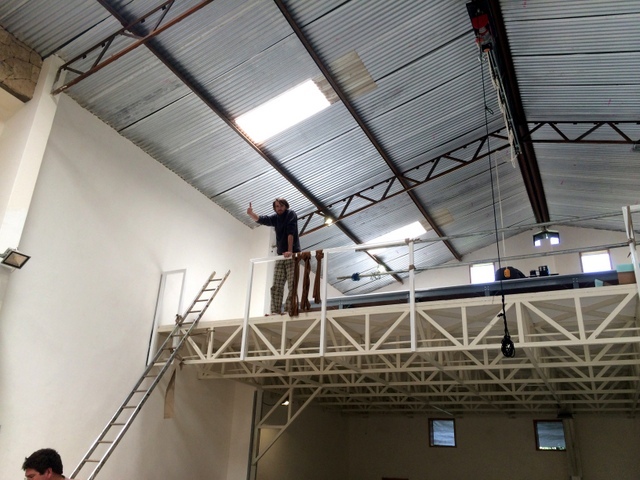 To meet their growing demand without cutting into the bush, they decided to expanded vertically, building a 75m2 mezzanine to house their marking and cutting. 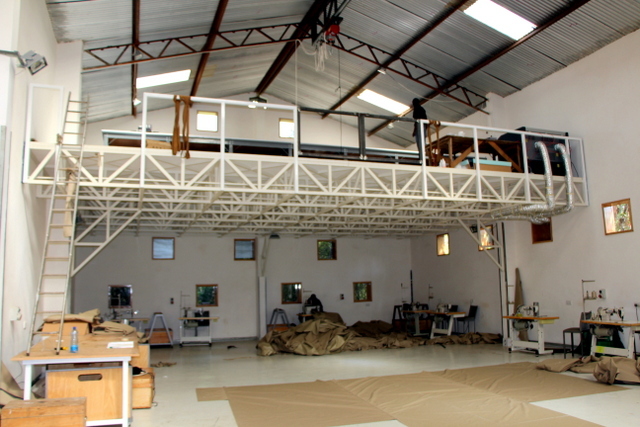 Building a mezzanine allowed Jan to add over 75m2 mezzanine working space, without sacrificing their existing floor space which is used for sewing and assembly. With added space, their sewers had more room to work. But a new bottleneck was created in the cutting department. 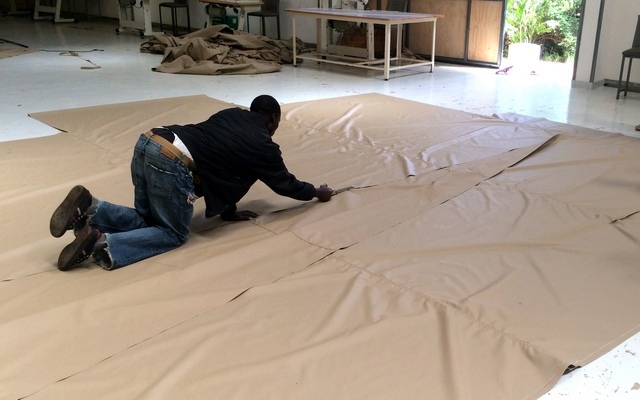 Only their lead sewer, Joshua, had the experience to scale and transfer detailed CAD drawings to their pre-sewn panels ready for cutting and marking. 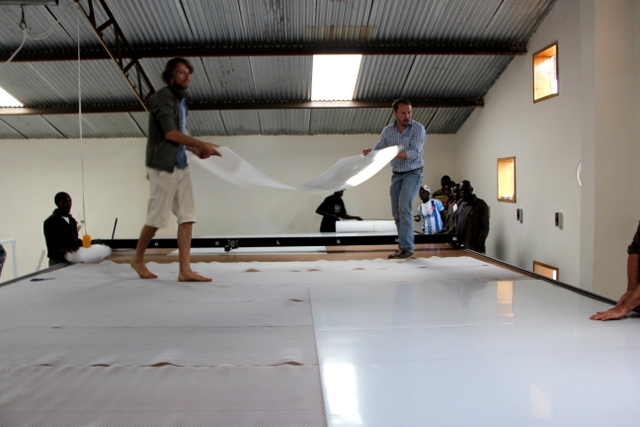 Jan and Joshua inspects a 5 panel cut to make sure the seams have even tension. It's easy to draw your patterns in CAD -- curves, marks across seams, large shapes, small marks. It's a whole different story to accurately place and mark these same rounded window cuts and seams on a pre-sewn 5meter wide panel consisting of two different materials, while crawling on your hands and knees. Marking and cutting was a very specialized job requiring skilled tradesman to spend hours on the floor marking patterns with a piece of chalk. This limited throughput, the size of job Jan was willing to quote, the number panels Joshua could supervise cut, and the complexity of drawings their lead designer, Maxim, could draw. Maxim uses Rhino and other structural design programs to create complex curves that maximize a structure's strength and aesthetic appeal. 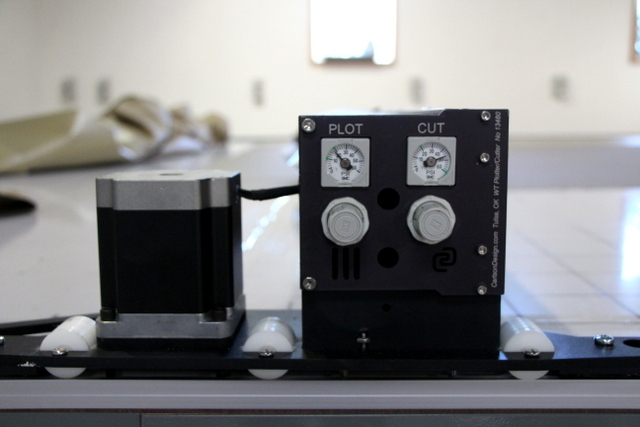 Which is why Maxim was SO excited to get a turn-key plotting/cutting system! WHY GET SUCH A WIDE SYSTEM? 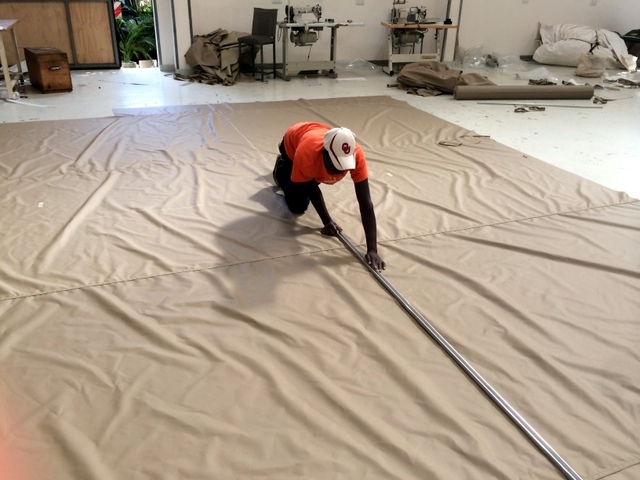 In order to make large roof and body panels for engineered fabric structures that maintain even tension and straight seams across multiple panels, ByDesign cuts their final shapes out of smaller pre-sewn panels. These panels are typically broken in 4m wide or narrower sections – so, Jan wanted a system that could mark and cut 4m panels and/or material. However, if given the opportunity, he probably would have gone wider — eventually deciding against it due to space limitations. To maintain even tension and straight seams, smaller panels are sewn together and a larger shapes is then cut out of the whole. 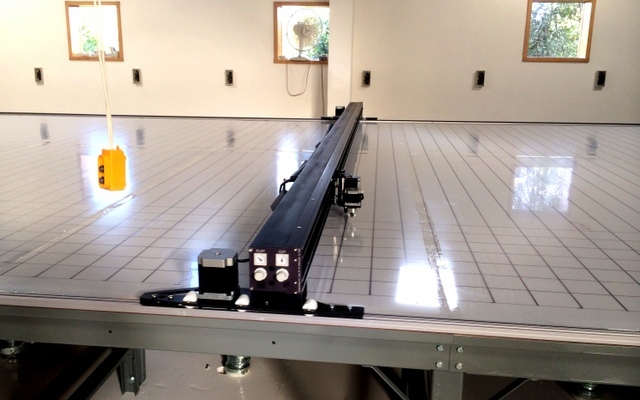 SEE VIDEO OF PRODUCTION MARKING AND CUTTING A ROOF PANEL. 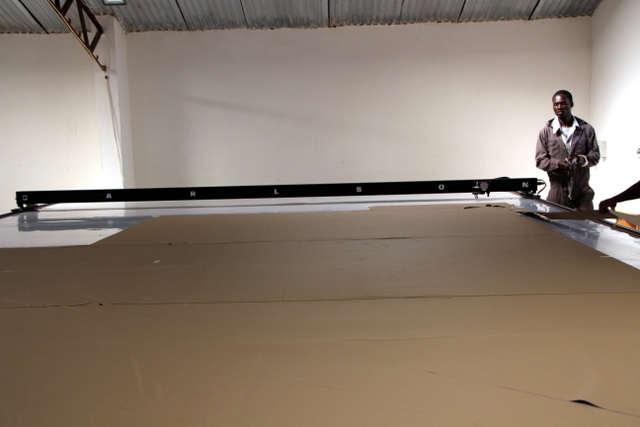 With the cutter, it now takes just 3 minutes to mark and cut a 3M x 5M roof panel with curved edges. Cycle time from start to finish is under 13 minutes — which includes loading, spreading, and folding material. That’s down from an hour or more to do each panel by hand. FOR THE FIRST JOB THEY WILL REDUCE CUT TIME BY 153 HOURS. THAT’S ALMOST 1 MONTH. 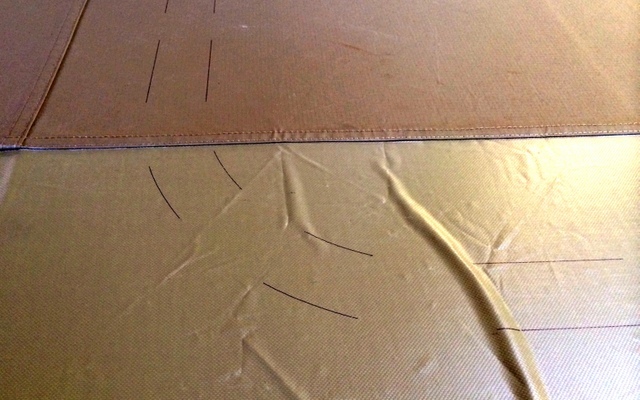 Marking a grid on the table helps square pre-sewn panels. The center of the center panel is centered on this alignment mark. 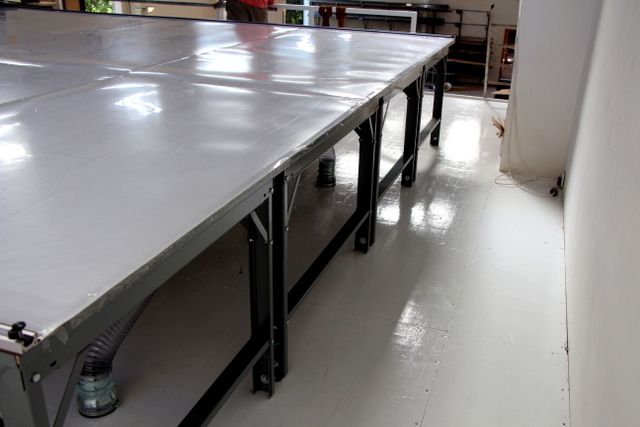 Panels consisting of sewn together PVC and Ripstop are also squared along the length of the table. Patterns are slid below the origin and the machine is started from a manual registration point near the center of the table. 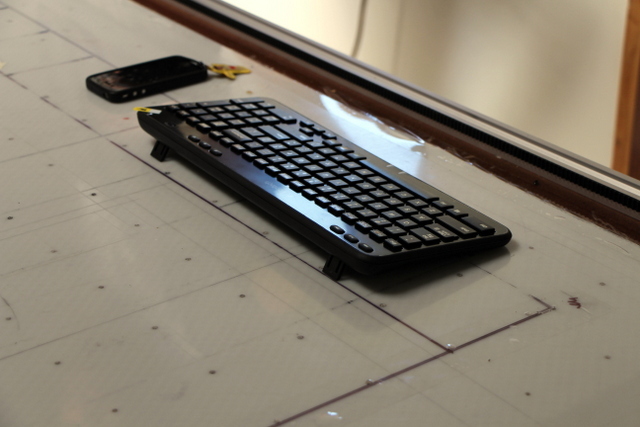 Maxim uses the wireless keyboard to jog the WT-174" into position. Finished cuts are neatly folded, labeled, and sent to the sewing department. 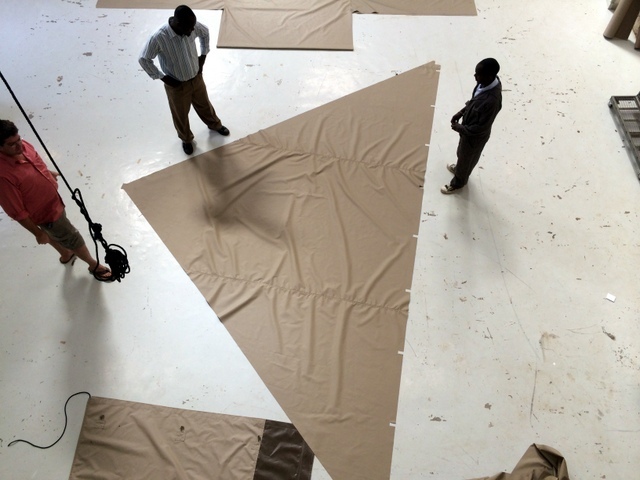 Correctly designing a tent pattern is a BIG deal. Studying the loads and tension at different panel connections, Maxim determined they were unintentionally introducing weakness and sag into their shapes tents. 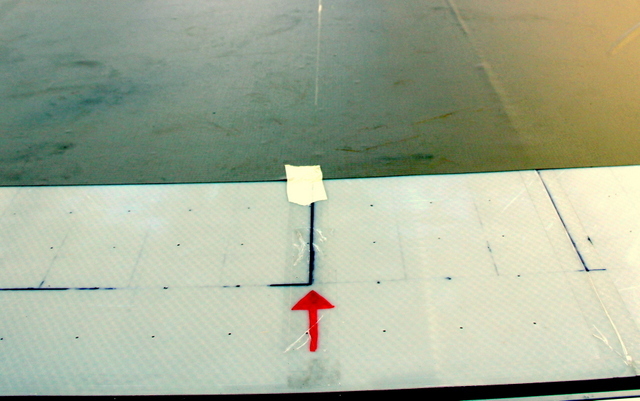 Using computer modeling, he was able to change the curve of the cut line and then quickly and accurately cut a new test panel on their Carlson Plotter/Cutter. Using the correct techniques for sending plot/cut lines to your plotter/cutter is also a BIG deal. During the design process, we showed Maxim how to modify his plotting path to reduce plot time by 13 minutes for each panel. This two hour redesign took half the morning, BUT it will reduce the marking time for the whole job by 42 hours! Well worth the upfront investment. Straighter cuts and cleaner seam lines also mean faster sewing times. 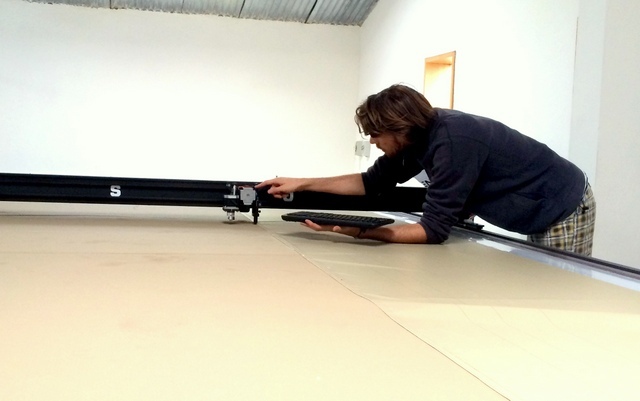 They started using their Plotter/Cutter to mark and slit PVC rolls in 6m long lengths. 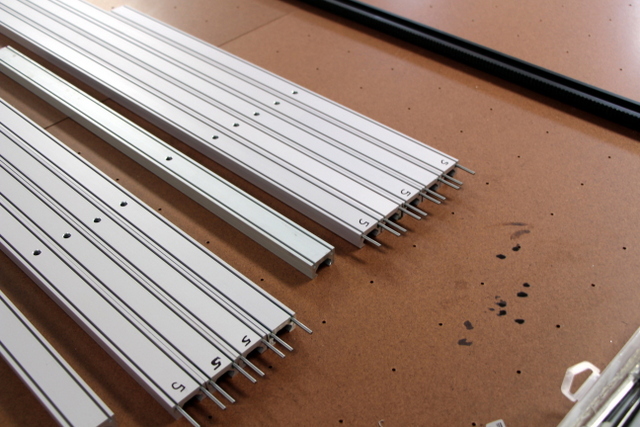 These straight cuts help keep the panels square, speeding up layup, assembly, and sewing. They set up every tent in their facility before shipping out to the wild. This way they can inspect the quality of each seam to ensure their tents have even tension and a snug fit for a great finish. 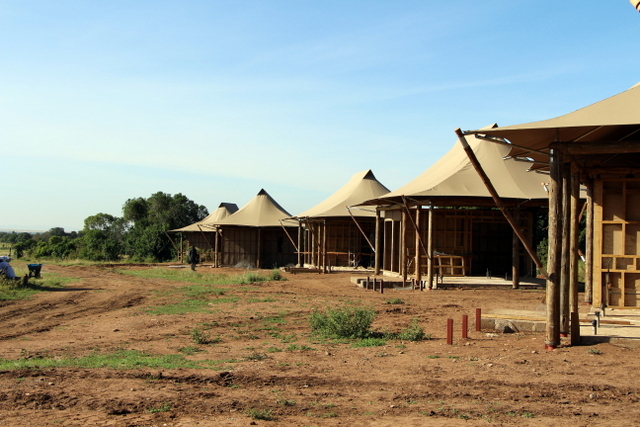 Tents starting to "go up" in the Masai Mara. Strong wind loads and extreme outdoor conditions demand high quality construction. 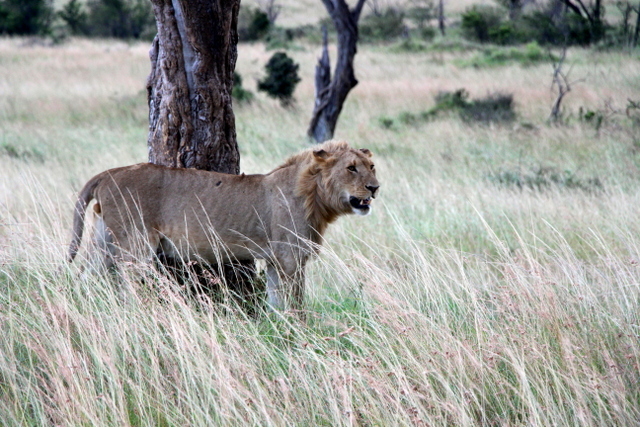 Because when you arrive at a luxury tent camp in the Masai Mara, you want to see this! Not crooked seams and loose fitting fabric. Maxim gives Carlson a "Thumbs Up"! Miyai -- the head technician -- and his guys give a "Thumbs up"! 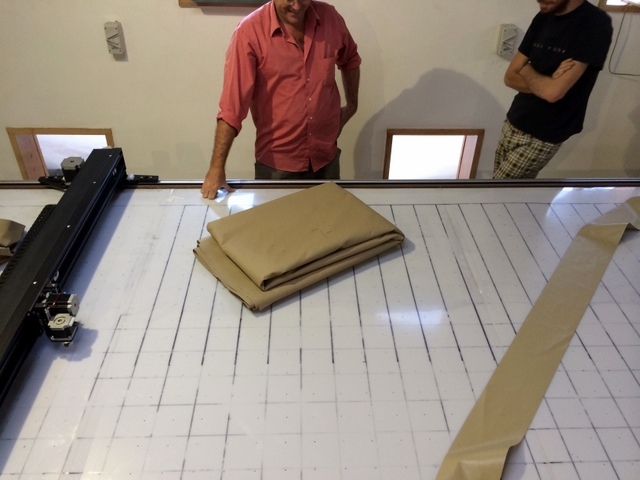 After examining time savings, Jan thought his plotter/cutter would pay for at least half it’s cost in the first two weeks! That’s just one job! 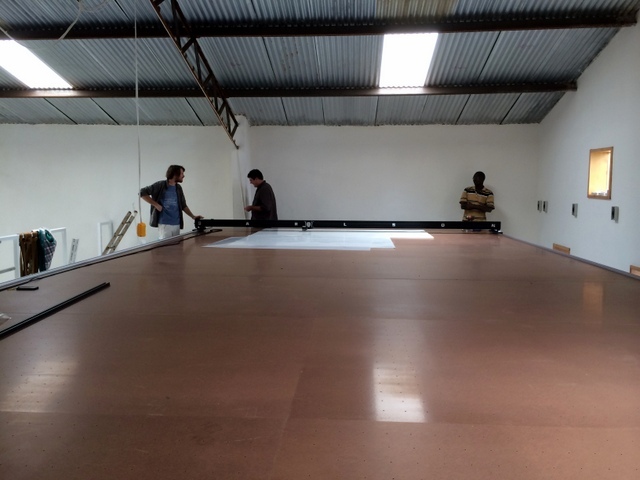 That’s why when they were debating whether or not to build their own vacuum table, install their own system, OR get a turn-key setup from Carlson Design, they opted to have us do everything. This is a pretty interesting idea. 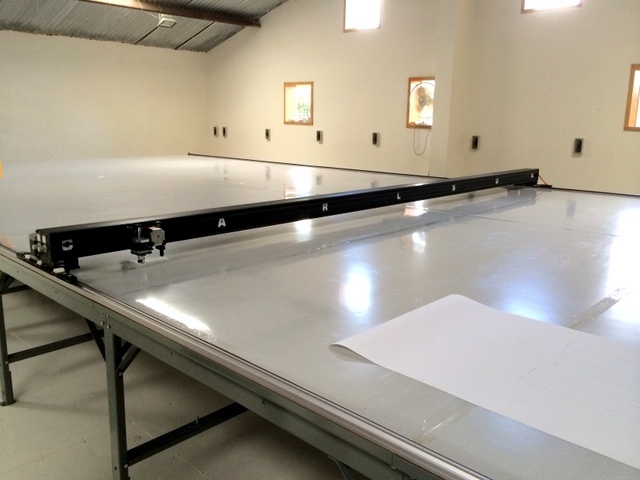 They have a metal fab shop, built their own building, and added the new Mezzanine — So why not build their own vacuum table or install their own plotter/cutter which would have been much easier than erecting a new workshop? Why — because they are busy. They purchased the Carlson Design WT-174″ Plotter/Cutter to eliminate a bottle neck in their production, not create a new one. 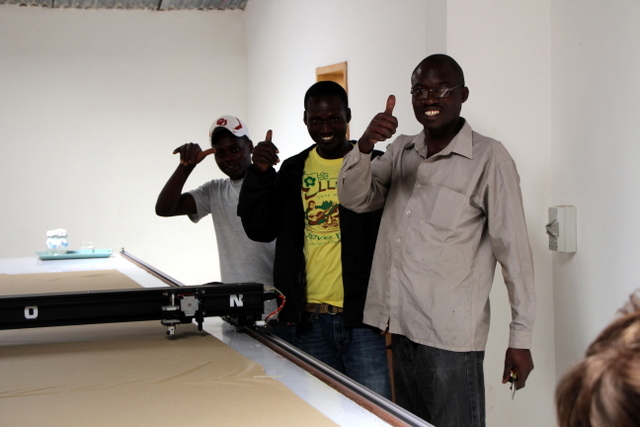 When we arrived, they were in the middle of production and excited to cut REAL jobs as on their plotter/cutter as soon as we would give them the green light. We were able to make our FIRST CUT BY 3PM ON THE FIRST DAY! 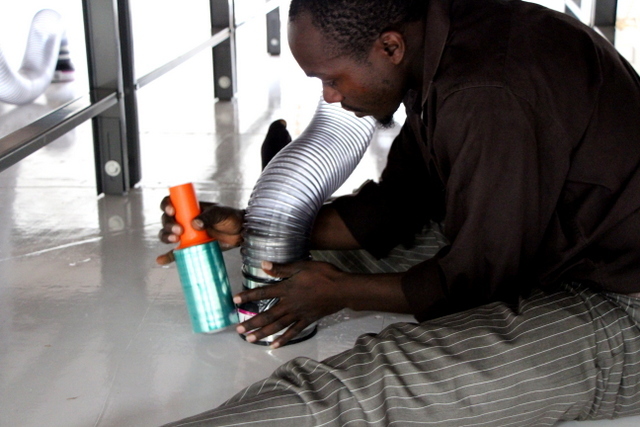 How — because they set up their Phillocraft vacuum table and installed their vacuum blowers BEFORE we arrived. They would rather us to teach them to use our software and NOT how to assemble a table. 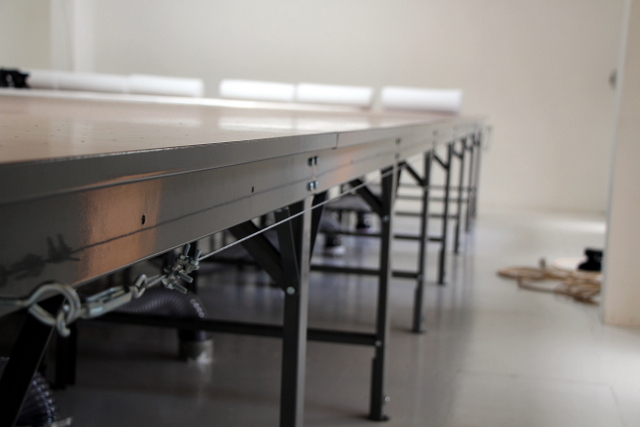 Their 14.5' x 28' Phillocraft table was assembled before we arrived! Table assembly, blower installation, and leveling took their staff about three days. 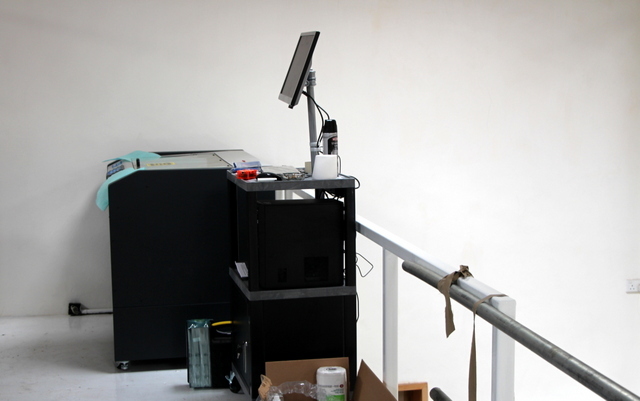 When we arrived we checked their work, made necessary adjustments, and then began installing their plotter/cutter. 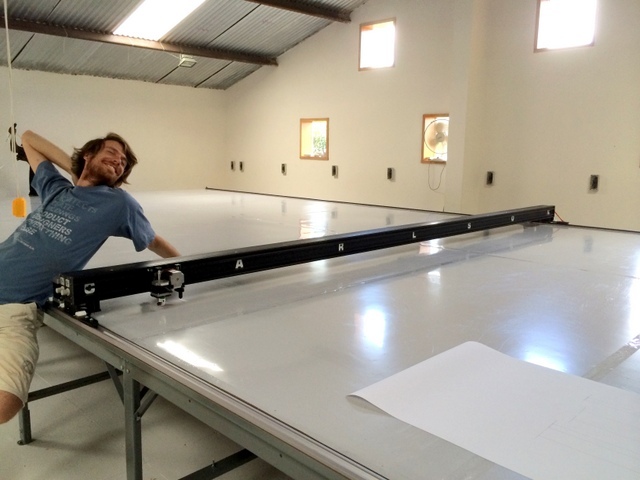 After we checked the table for LEVEL and SQUARE, we were able to start installing their track system right away. 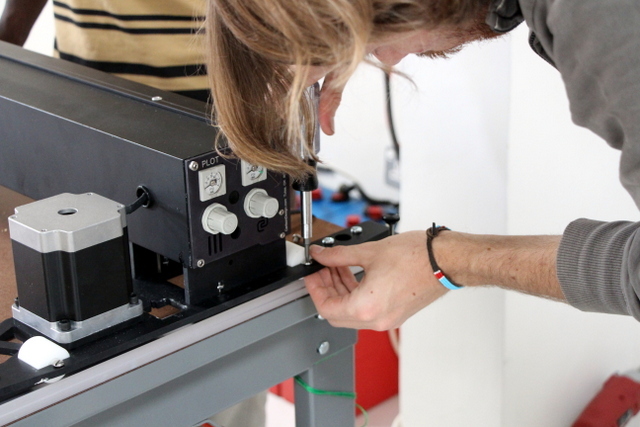 We were calibrating the plotter/cutter AND performing our first test cut by 3PM on the first day. Maxim and Jan both have a good grasp of Computer Aided Design (CAD). 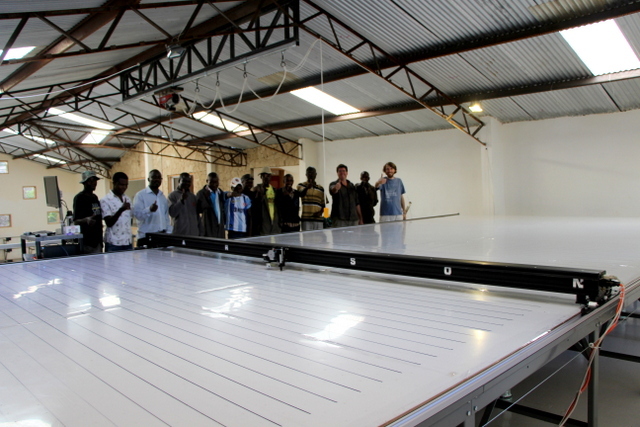 Our job during the installation was to help them understand how to import, optimize, and then plot/cut those CAD drawings using the Carlson software and a Carlson Plotter/Cutter. We began by taking a real job file, importing it into Plotmaster, optimizing it in PEdit, and then marking and cutting on real material. There was a risk that we would ruin this more expensive “real” material instead of using scrap, but as Jan said, “If something is going to go wrong, we want it to go wrong while you’re here.” With each panel set we cut they were better able to explain what they needed and we were in a better position to show them how to do it. In addition to training, we were also filling orders! Maxim taking notes during training. 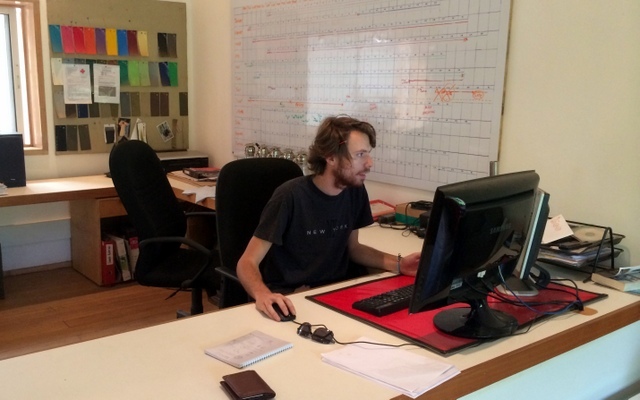 In a production setting, training is about repetition, repetition, repetition. 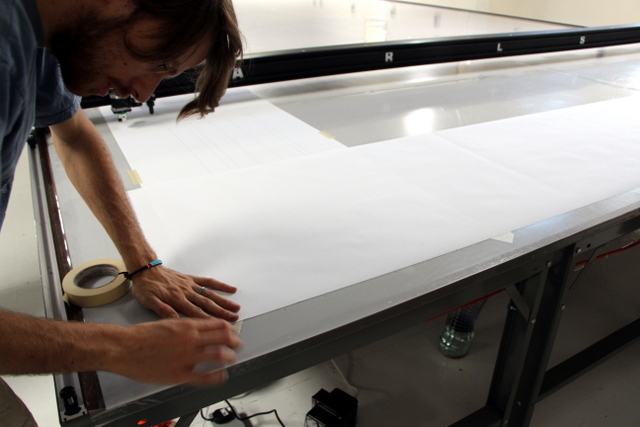 By the end of the second day, Maxim was ready to cut a full tent set for test assembly. 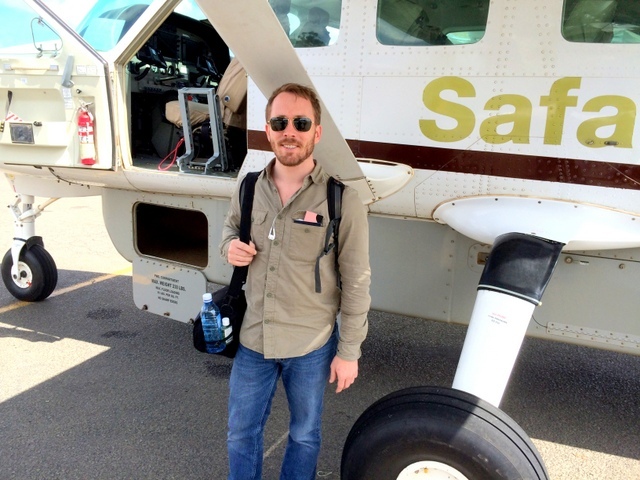 Jan had invited us to join him at the job site in the Masai Mara, so we left Maxim to continue cutting and making a list of questions, while we headed out into the wild to learn more about how they make their tents. Thomas Carlson headed on Safari! Cruising at 135kts @ 10k ft we flew for 1HR to the Kichwa Tembo Safari Camp on the edge of the Masai Mara. Tents being assembled. This is a permanent tent camp, with electricity and plumbing. 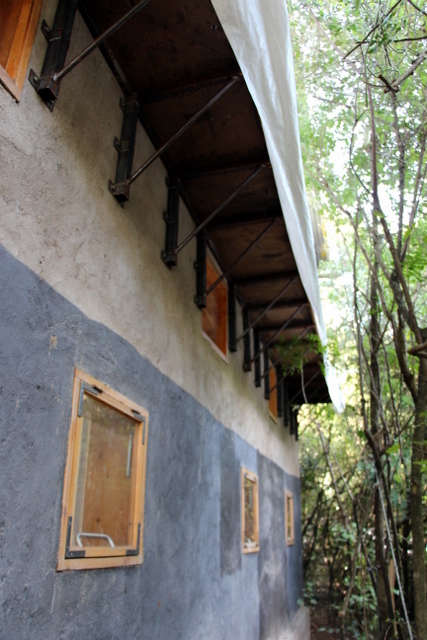 When the fabric walls are added, they want the seams in the roof panels to match the seams in the wall panels. 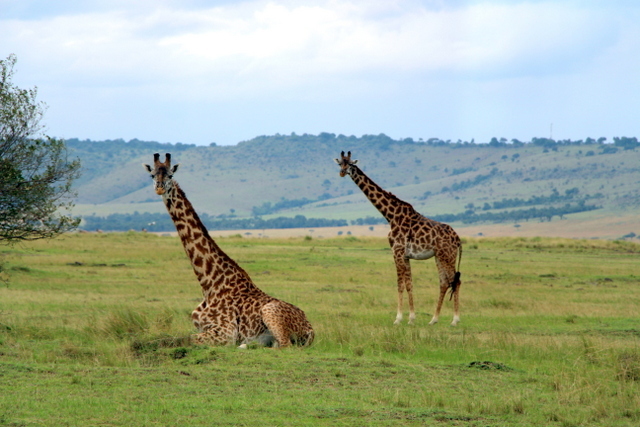 You can't go to the Masai Mara without sticking your neck out a little and seeing some wild life. And we'd be Lion if we said we weren't having a great time! After seeing the job site, we began discussing the wide variety of products and materials they could cut with their plotter/cutter. These included patches, leather, mesh, velcro, car covers, seat covers, uniforms, and enclosures. 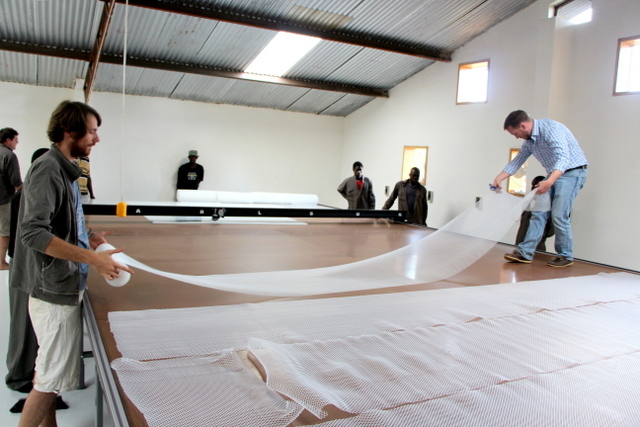 The first thing we test cut was a 4 meter wide roll of mesh. 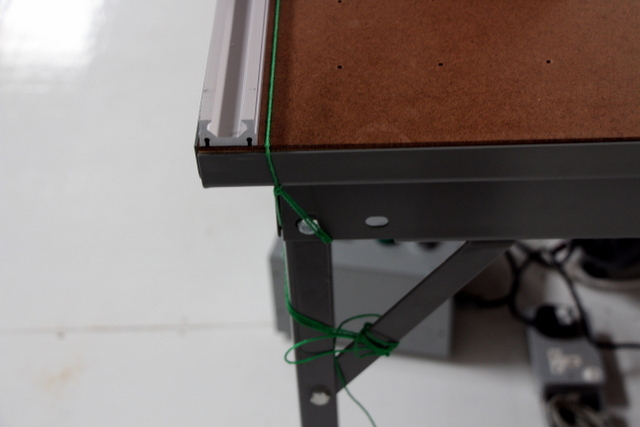 The mesh is delivered folded in half — leaving a wrinkle down the center of the table. Because the mesh is porous, we cannot vacuum it during cut without a plastic film. But, by taping the edges, slowing down the machine, and using a new sharp blade, we can accurately cut mesh with limited shift. Even running the machine slowly is still REALLY FAST!!! We cut 14 large mesh panels in 5minutes. One of the hand cutters, Thomas, thought this would take him 1.5 hours by hand! Once you start automating, it’s addictive. With the success of tent cutting (their primary objective) running smoothly, they have started looking for increased functionality. In the future they will use our Hot Knife to cut velcro, a drag blade to cut leather, and our T-Bar Digitizer to trace existing apparel and canvas patterns. Remember — if your plotter/cutter is moving, it means you are making money! Below are pictures and notes from our assembly. Setting up an ultra-wide cutting system requires a good eye for detail. These tricks and tips can help you decide if you would like to try setting up your own system or having us out to help you get started. 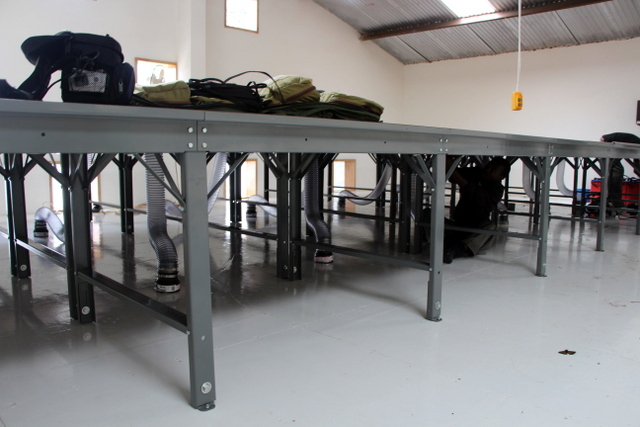 The mezzanine was drawn in Rhino and calculated the floor would sag less than 5mm. 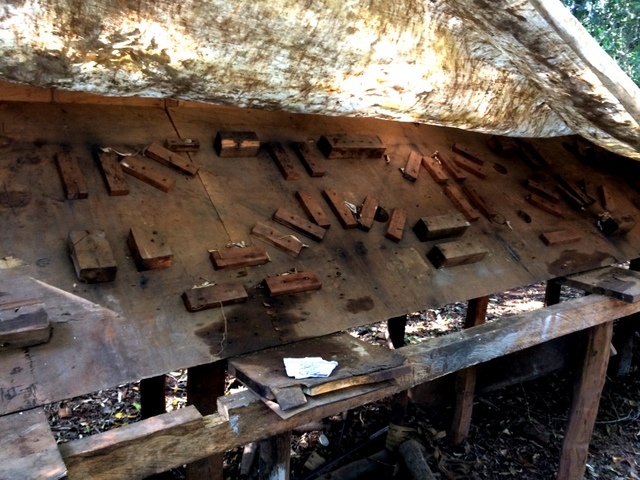 This wooden jig was made up to frame the floor's trusses. 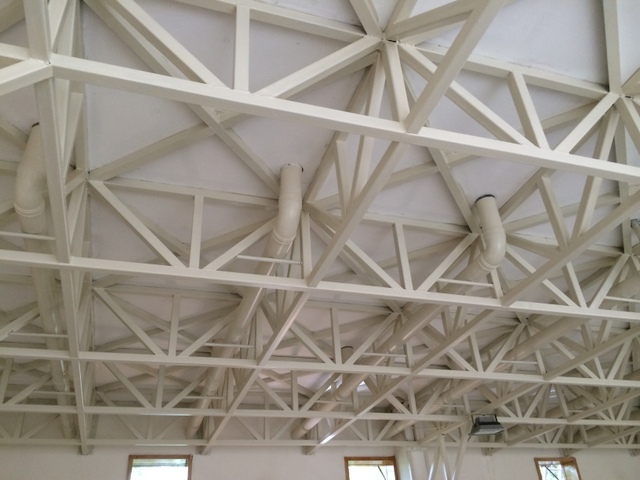 Mezzanine floor structure. Note the plumbing runs underneath the floor and outside to the blowers. This virtually eliminating blower noise inside the building. When we arrived they were putting the final touches on the table. 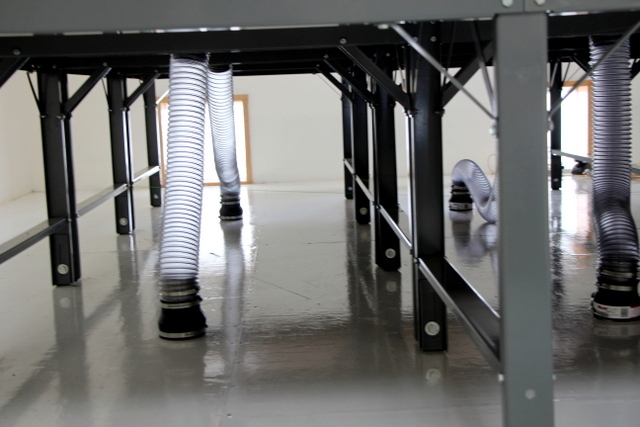 They used rigid PVC under the floor (which they provided) and flexible plumbing above (which we provided). This allowed them to easily adapt their setup during assembly. A ladder leading to the blowers. We shipped seven single-phase 3hp radial vacuum blowers. 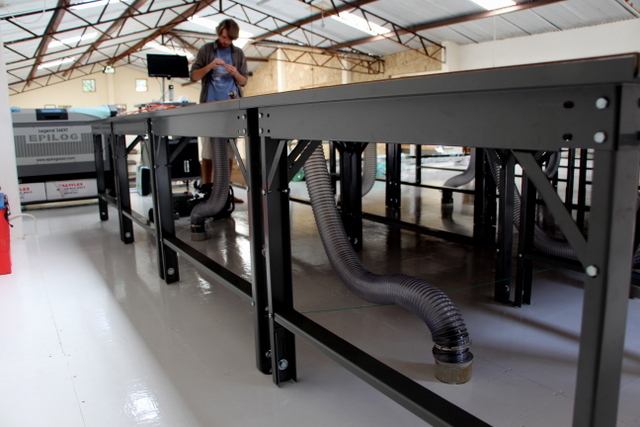 Each blower was plumbed to two sections of their 14.5' x 28' vacuum table. Outside blower ledge. Each blower is wired on its own switch to prevent overloading their power grid. Sneak peak. 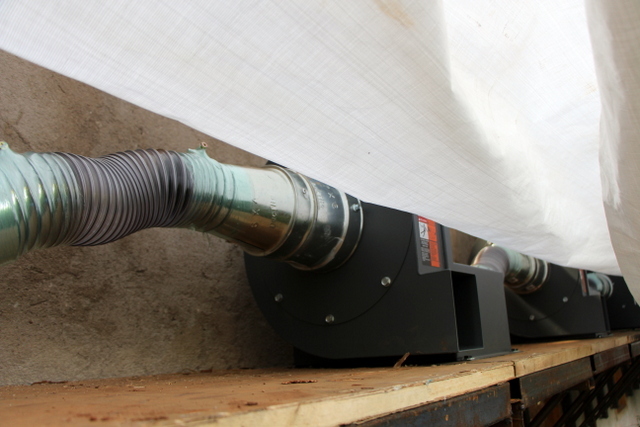 Blowers are temporarily stored under a tarp until they can build a permanent cover. Wrapping plumbing connections to prevent any vacuum leaks. The table was pretty level and squared when we arrived. The more level the table, the faster the plotter/cutter can operate. They pre-assembled the computer cart. This is a simple step that can save us 1-2 hours -- which means that much more time for training. Since the table, blowers, and cart were already assembled, we were able to start installing the track immediately. Step 1, layout track and set track pins with Loctite. While the Loctite sets up, run cable management. 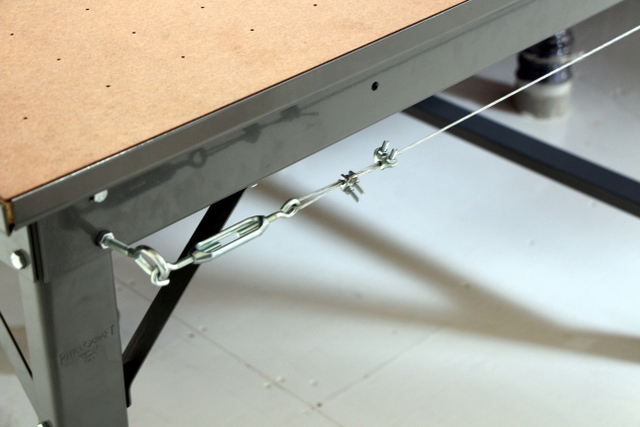 Zip tie Power, Air, and Control together loosely every 2' or 3'. Run a cable along one side to hold your cable management. Tighten the cable with the turnbuckle. Attach cable. Cable should have a slight drape and never be so tight that it puts any load on the plotter/cutter. Do not put so much drape that cable drags on the ground. 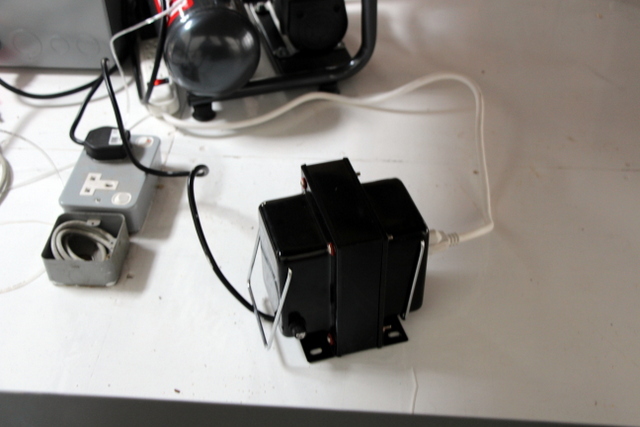 A step down transformer converts 230vac to 110vac. 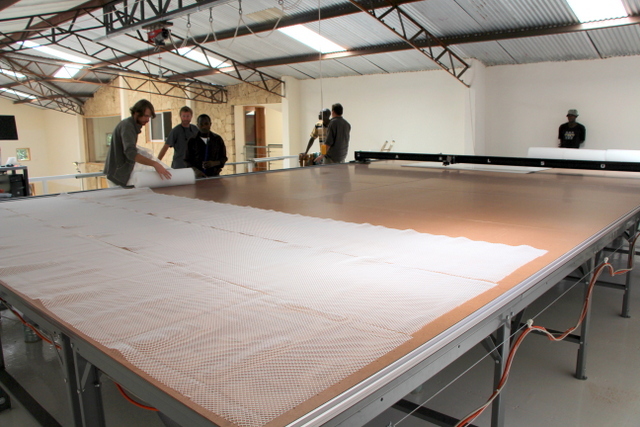 ByDesign also connected their plotter/cutter to four large batteries to prevent any issues from periodic power loss common in Kenya. 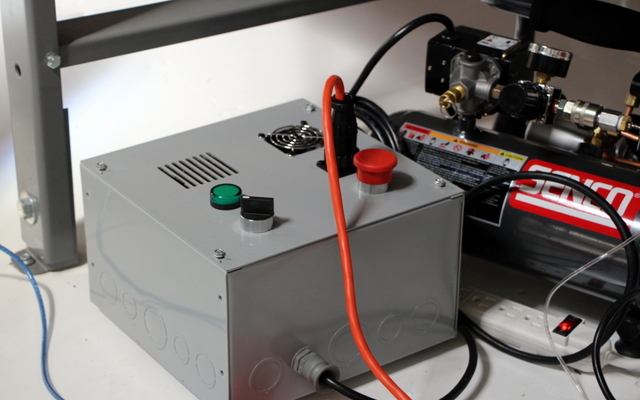 The off-board power supply decreases the overall system weight. This ultra-quiet 1 gallon air compressor is all that is needed to control the up/down air pressure for the pen and cutter. 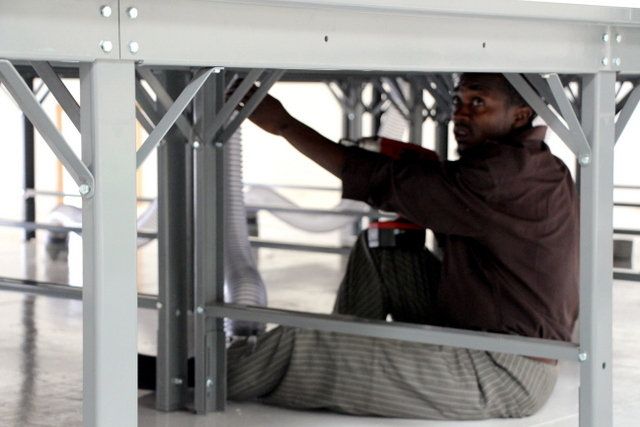 Small, quiet air compressors are hard to find in Africa so we included one with the system. On-board air regulators for the pen and cutter allow the operator to set marking and cutting tool pressure. Set pen at ~15psi and cutter at ~35psi. Attach track side A. Align end with the edge of the table. Using a string can help align this first side. Thoroughly rub drive belt with acetone and attach to side A with double-sided tape. It's usually easier to attach side A drive belt before adding the plotter/cutter. Set side B loosely in place. 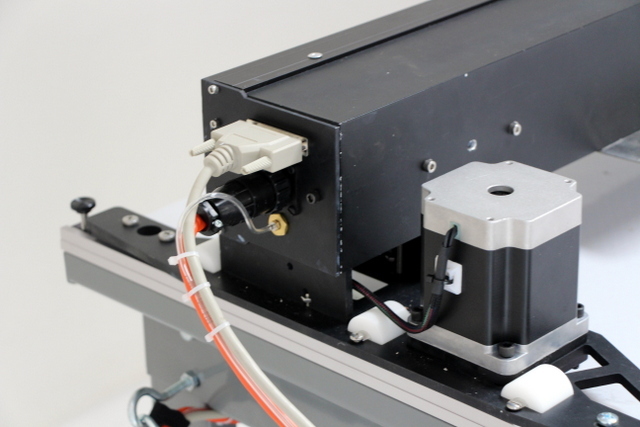 Set the plotter/cutter on the track and adjust load wheels and trolleys so it glides smoothly. The Plotter/Cutter acts as a jig to square side B. We recommend finishing the track install all at once. Do not leave unattached track B sitting on the table. With the track installed, it's time to break for lunch. 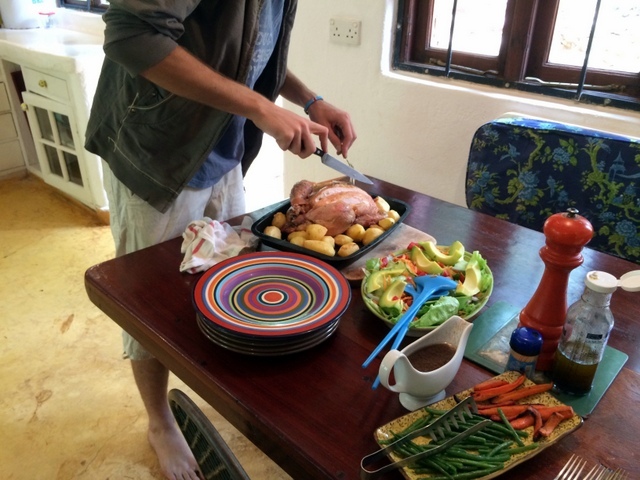 It was Thanksgiving every day -- what a meal! Almost done. After lunch we spread the mesh. This breather layer creates an air channel between your table top and cutting surface. Spread mesh horizontally and you can get more out of the roll this way. Layout plastic sheeting. Be careful not to move the mesh as you walk on the table. 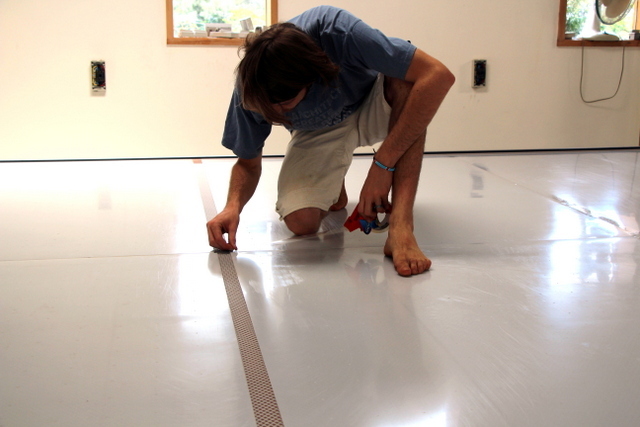 Flip and rotate the plastic sheets to find the tightest fit. Tape plastic cutting surface together using clear packing tape. The cutting surface will expand and contract as your room heats and cools. If you permanently secure it to the table, it will bubble and warp. Taping the seams allows you to easily release tension and keep your cutting surface flat in varying weather conditions. 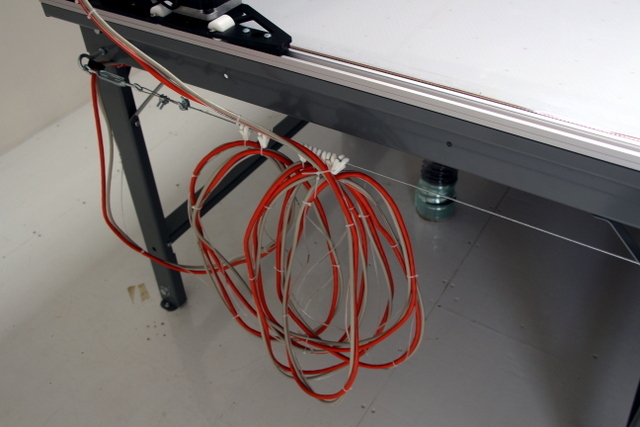 Connect cabling to the plotter/cutter. 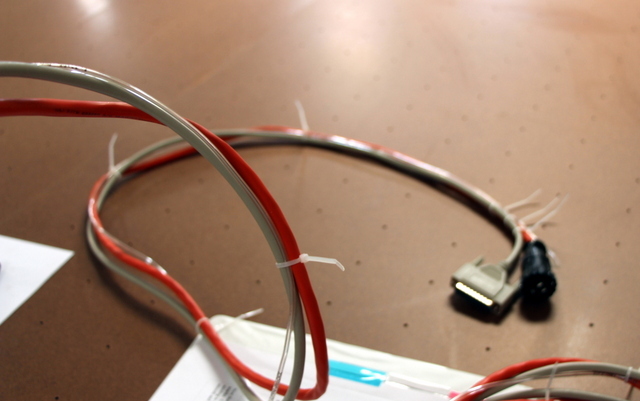 Connect cabling to the operator's workstation. 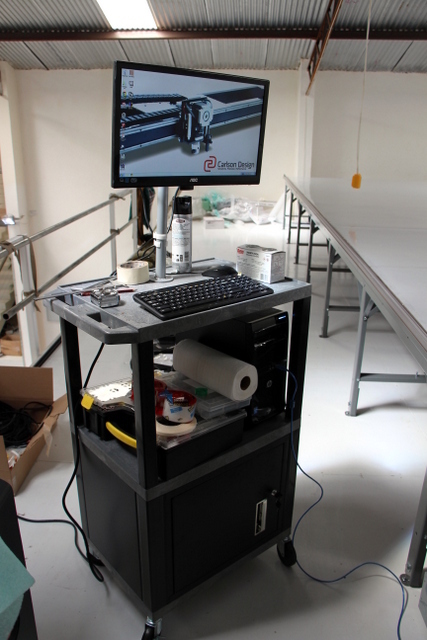 A wireless keyboard helps the operator jog the plotter/cutter without standing at the workstation. Installation Complete! It's now time to square and calibrate the system. We were test plotting by 3PM on the first day! 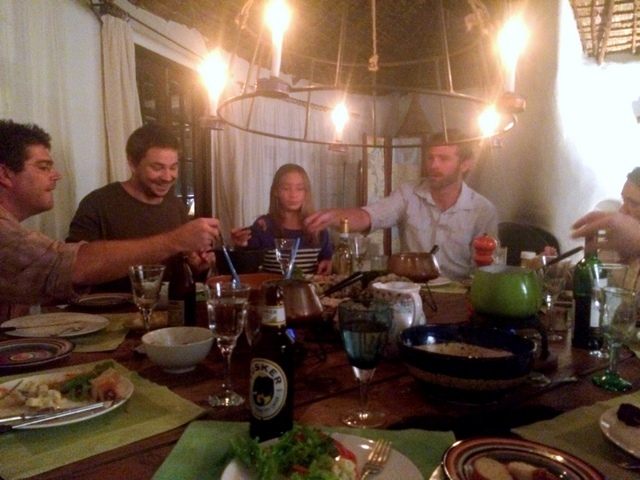 We’d like to give a HUGE thanks to Jan, his lovely wife Erin, Maxim, Joshua, Thomas, Miyia, and Nicolas. What an an amazing team and one of our favorite installations to-date. 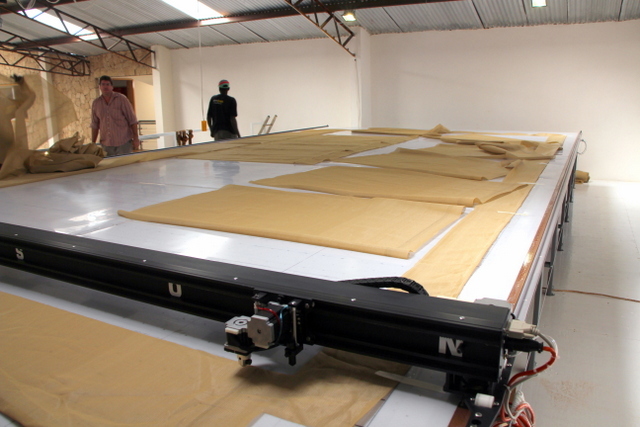 We look forward to seeing the amazing products you all design, cut, sew, and install! Thanks for making us feel right at home among new friends! And letting us spend time on your beautiful porch. Till next time! “Thumbs Up”!